The State Department on Thursday announced it would provide a humanitarian aid package worth nearly $32 million to the Rohingya, a persecuted minority group in Burma, most of whom are Muslim. More than 400,000 Rohingya have fled Burma, a majority Buddhist nation, for Bangladesh over the past month to escape wide-scale violence that the United Nations' top human rights official has labeled ethnic cleansing. The aid package came the day after Secretary of State Rex Tillerson spoke with Aung San Suu Kyi, the de facto leader of Burma, and urged the Burmese government and military to "address deeply troubling allegations of human rights abuses and violations." Tillerson's quick efforts to help the Rohingya demonstrated the State Department's ability to quickly direct humanitarian aid to a threatened minority group. 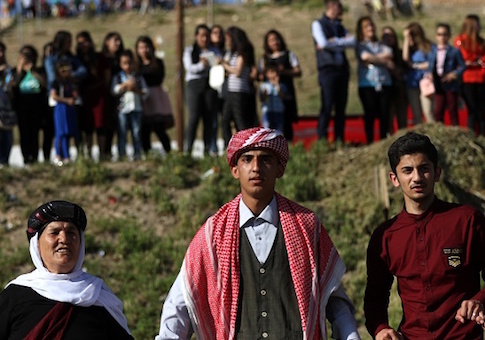 However, critics say the swift action stands in sharp contrast to State's foot-dragging when it comes to directing funds to Yazidis, Christians, and other religious minorities facing genocide in Iraq. Lawmakers who passed the bills providing the funds, as well as human rights activists and Catholic charities, were encouraged by Tillerson's affirmation of the genocide declaration, but they say his statements have done nothing to change the situation on the ground. The Yazidis and Christians are still not getting the necessary money to help them rebuild their lives and communities in the Northern Iraq's Ninevah province, where they have thrived for thousands of years. Stephen Rasche, general counsel of the Archdiocese of Erbil, Iraq, applauded the State Department's assistance to the Rohingya community in Burma. However, he and other Catholic leaders remain "deeply concerned" that the U.S. government has still directed "little or no aid" to the Christian community in Iraq despite its clear declaration that ISIS committed genocide against Christians. President Trump promised to aid the victims of ISIS genocide, and Congress has placed a statutory obligation on the State Department and the U.S. Agency for International Development to do so before the current fiscal year runs out in a few days, Rasche said. "We urge these government agencies to make good on President Trump's promise and to immediately assist the Christian, Yazidi, and other religious minority victims of genocide in Iraq," he said. Despite the congressional commitment, lawmakers and human rights activists say most of the U.S. taxpayer money going to help people in Iraq is channeled through the United Nations, which has a "religion-blind" policy of distributing most of the money to refugee camps that Yazidis and Christians avoid out of fear of further violence and persecution. "It is always good when people who are in danger are helped. But why is there a terrible disparity between our government's treatment of the Rohingya Muslims in Burma and the absolute lack of help for Yazidis and Christians in Iraq, whom Secretary Tillerson declared last month to be victims of genocide?" asked Nina Shea, an international human rights lawyer who directs the Hudson Institute's Center for Religious Freedom. "In Iraq, we should be helping people who are victims of genocide, but our government is not," she said. "We should be caring for religious minorities. But our government is not. We should be concerned about religious freedom. But our government is not." If they had the resources, they also could combat Iran's colonization of northern Iraq, where pro-Iranian militias are illegally buying up Christian-owned property in the area to try to broaden their influence, she said. "Right now, Iran is using the Ninevah province as a land bridge to Syria and the Mediterranean and that is a threat to our interests and Israel's interests," she said. The State Department's inaction continues despite Trump's promise to do everything in his power to defend and protect "historic Christian communities of the Middle East." Trump made the pledge after meeting with Pope Francis and again in the wake of the ISIS attack on Coptic Christians in Egypt in late May. "The United States closely monitors the needs of all vulnerable, displaced and conflict-affected populations, including members of religious and ethnic minorities and has taken extraordinary measures to aid imperiled civilians," the official said in a statement to the Washington Free Beacon. "Freedom of thought, conscience, and religion or belief is fundamental to the United States and who we are. The United States remains committed to ensuring the protection of religious freedoms for all," the official added. Lawmakers on Capitol Hill and human rights activists are tracking the list of U.N. development projects in Iraq closely and said there are only very minor projects in Christian towns and communities. Shea said she is aware of one that would repair a canopy on a municipal building but that she believes there are no major infrastructure or road projects that would help Christian communities return and provide interim jobs for those returning. The Iranians, in contrast, just opened a new elementary school, mosque, and library in the Ninevah region, Shea said. U.N. Ambassador Nikki Haley called the resolution creating the team a "landmark" development. "It is a major step towards addressing the death, suffering, and injury of the victims of crimes committed by ISIS in Iraq—crimes that include genocide. These victims have been Yazidis, Christians, Shia and Sunni Muslims, and many, many more." Update 9:26 a.m.: This post has been updated for clarity. This entry was posted in National Security and tagged Iraq, Rex Tillerson, State Department, United Nations. Bookmark the permalink.